"DoD" redirects here. For other uses, see DOD. The Department of Defense (DoD, USDOD, or DOD) is an executive branch department of the federal government charged with coordinating and supervising all agencies and functions of the government concerned directly with national security and the United States Armed Forces. The department is the largest employer in the world, with nearly 1.3 million active duty servicemen and women[a] as of 2016. Adding to its employees are over 826,000 National Guardsmen and Reservists from the four services,[b] and over 732,000 civilians bringing the total to over 2.8 million employees. Headquartered at the Pentagon in Arlington, Virginia, just outside Washington, D.C., the DoD's stated mission is to provide "the military forces needed to deter war and ensure our nation's security". The Department of Defense is headed by the Secretary of Defense, a cabinet-level head who reports directly to the President of the United States. Beneath the Department of Defense are three subordinate military departments: the United States Department of the Army, the United States Department of the Navy, and the United States Department of the Air Force. In addition, four national intelligence services are subordinate to the Department of Defense: the Defense Intelligence Agency (DIA), the National Security Agency (NSA), the National Geospatial-Intelligence Agency (NGA), and the National Reconnaissance Office (NRO). Other Defense Agencies include the Defense Advanced Research Projects Agency (DARPA), the Defense Logistics Agency (DLA), the Missile Defense Agency (MDA), the Defense Health Agency (DHA), Defense Threat Reduction Agency (DTRA), the Defense Security Service (DSS), and the Pentagon Force Protection Agency (PFPA), all of which are under the command of the Secretary of Defense. Additionally, the Defense Contract Management Agency (DCMA) provides acquisition insight that matters, by delivering actionable acquisition intelligence from factory floor to the warfighter. Military operations are managed by ten regional or functional Unified combatant commands. The Department of Defense also operates several joint services schools, including the Eisenhower School (ES) and the National War College (NWC). The history of the defense of the United States started with the Continental Congress in 1775. The creation of the United States Army was enacted on 14 June 1775. This coincides with the American holiday Flag Day. The Second Continental Congress would charter the United States Navy, on 13 October 1775, and create the United States Marine Corps on 10 November 1775. Upon the seating of the first Congress on 4 March 1789, legislation to create a military defense force stagnated as they focused on other concerns relevant to setting up the new government. President George Washington went to Congress to remind them of their duty to establish a military twice during this time. Finally, on the last day of the session, 29 September 1789, Congress created the War Department, historic forerunner of the Department of Defense. The War Department handled naval affairs until Congress created the Navy Department in 1798. The secretaries of each of these departments reported directly to the president as cabinet-level advisors until 1949, when all military departments became subordinate to the Secretary of Defense. After the end of World War II, President Harry Truman proposed creation of a unified department of national defense. In a special message to Congress on 19 December 1945, the President cited both wasteful military spending and inter-departmental conflicts. Deliberations in Congress went on for months focusing heavily on the role of the military in society and the threat of granting too much military power to the executive. On 26 July 1947, Truman signed the National Security Act of 1947, which set up a unified military command known as the "National Military Establishment", as well as creating the Central Intelligence Agency, the National Security Council, National Security Resources Board, United States Air Force (formerly the Army Air Forces) and the Joint Chiefs of Staff. The act placed the National Military Establishment under the control of a single Secretary of Defense. The National Military Establishment formally began operations on 18 September, the day after the Senate confirmed James V. Forrestal as the first Secretary of Defense. 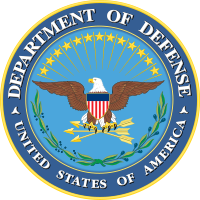 The National Military Establishment was renamed the "Department of Defense" on 10 August 1949 and absorbed the three cabinet-level military departments, in an amendment to the original 1947 law. Under the Department of Defense Reorganization Act of 1958 (Pub.L. 85–599), channels of authority within the department were streamlined, while still maintaining the ordinary authority of the Military Departments to organize, train and equip their associated forces. 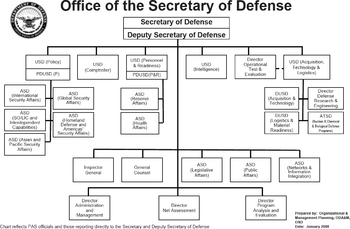 The Act clarified the overall decision-making authority of the Secretary of Defense with respect to these subordinate Military Departments and more clearly defined the operational chain of command over U.S. military forces (created by the military departments) as running from the president to the Secretary of Defense and then to the unified combatant commanders. Also provided in this legislation was a centralized research authority, the Advanced Research Projects Agency, eventually known as DARPA. The act was written and promoted by the Eisenhower administration, and was signed into law 6 August 1958. The Secretary of Defense, appointed by the president with the advice and consent of the Senate, is by federal law (10 U.S.C. § 113) the head of the Department of Defense, "the principal assistant to the President in all matters relating to Department of Defense", and has "authority, direction and control over the Department of Defense". Because the Constitution vests all military authority in Congress and the president, the statutory authority of the Secretary of Defense is derived from their constitutional authorities. Since it is impractical for either Congress or the president to participate in every piece of Department of Defense affairs, the Secretary of Defense, and the secretary's subordinate officials generally, exercise military authority. The Department of Defense is composed of the Office of the Secretary of Defense (OSD), the Joint Chiefs of Staff (JCS) and the Joint Staff (JS), Office of the Inspector General (DODIG), the Combatant Commands, the Military Departments (Department of the Army (DA), Department of the Navy (DON) & Department of the Air Force (DAF)), the Defense Agencies and Department of Defense Field Activities, the National Guard Bureau (NGB), and such other offices, agencies, activities, organizations, and commands established or designated by law, or by the president or by the Secretary of Defense. 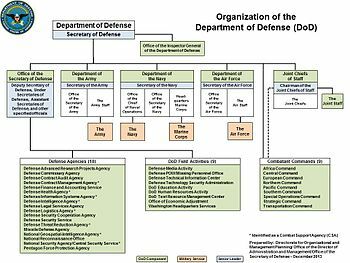 The Office of the Secretary of Defense (OSD) is the secretary and deputy secretary's (mainly) civilian staff. OSD is the principal staff element of the Secretary of Defense in the exercise of policy development, planning, resource management, fiscal and program evaluation and oversight, and interface and exchange with other U.S. Government departments and agencies, foreign governments, and international organizations, through formal and informal processes. OSD also performs oversight and management of the Defense Agencies and Department of Defense Field Activities. Several defense agencies are members of the United States Intelligence Community. These are national-level intelligence services that operate under the jurisdiction of the Department of Defense but simultaneously fall under the authorities of the Director of National Intelligence. They fulfill the requirements of national policy makers and war planners, serve as Combat Support Agencies, and also assist non-Department of Defense intelligence or law enforcement services such as the Central Intelligence Agency and the Federal Bureau of Investigation. The military services each have their own intelligence elements which are distinct from but subject to coordination, by national intelligence agencies under Department of Defense. Department of Defense manages the nation's coordinating authorities and assets in disciplines of signals intelligence, geospatial intelligence, and measurement and signature intelligence, and also builds, launches and operates the Intelligence Community's satellite assets. Department of Defense also has its own human intelligence service, which contributes to the CIA's human intelligence efforts while also focusing on military human intelligence priorities. These agencies are directly overseen by the Undersecretary of Defense for Intelligence. The Joint Chiefs of Staff (JCS) is a body of senior uniformed leaders in the Department of Defense who advise the Secretary of Defense, the Homeland Security Council, the National Security Council and the president on military matters. The composition of the Joint Chiefs of Staff is defined by statute and consists of the Chairman of the Joint Chiefs of Staff (CJCS), Vice Chairman of the Joint Chiefs of Staff (VCJCS), Senior Enlisted Advisor to the Chairman (SEAC), the Military Service Chiefs from the Army, Marine Corps, Navy, and Air Force, in addition to the Chief of National Guard Bureau, all appointed by the president following Senate confirmation. Each of the individual Military Service Chiefs, outside their Joint Chiefs of Staff obligations, works directly for the Secretary of the Military Department concerned: the Secretary of the Army, Secretary of the Navy and Secretary of the Air Force. Following the Goldwater-Nichols Act in 1986 the Joint Chiefs of Staff do not have operational command authority, neither individually nor collectively, as the chain of command goes from the president to the Secretary of Defense, and from the Secretary of Defense to the commanders of the Combatant Commands. Goldwater-Nichols also created the office of vice-chairman, and the chairman is now designated as the principal military adviser to the Secretary of Defense, the Homeland Security Council, the National Security Council and to the president. The Joint Staff (JS) is a headquarters staff at the Pentagon made up of personnel from all four services that assist the Chairman and Vice Chairman in discharging their duties, and managed by the Director of the Joint Staff (DJS) who is a Lieutenant General or Vice Admiral. the Department of the Army, which the United States Army is organized within. the Department of the Navy, which the United States Navy and the United States Marine Corps are organized within. the Department of the Air Force, which the United States Air Force is organized within. The Military Departments are each headed by their own secretary (i.e., Secretary of the Army, Secretary of the Navy and Secretary of the Air Force), appointed by the president, with the advice and consent of the Senate. They have legal authority under Title 10 of the United States Code to conduct all the affairs of their respective departments within which the military services are organized. The secretaries of the Military Departments are (by law) subordinate to the Secretary of Defense and (by SecDef delegation) to the Deputy Secretary of Defense. The secretaries of the Military Departments, in turn, normally exercises authority over their forces by delegation through their respective Service Chiefs (i.e., Chief of Staff of the Army, Commandant of the Marine Corps, Chief of Naval Operations, and Chief of Staff of the Air Force) over forces not assigned to a Combatant Command. The secretaries of the Military Departments and the Service Chiefs do not possess operational command authority over U.S. troops (this power was stripped from them in the Defense Reorganization Act of 1958), and instead the Military Departments are tasked solely with "the training, provision of equipment, and administration of troops." A Unified Combatant Command is a military command composed of personnel and equipment from at least two Military Departments, which has a broad and continuing mission. The Military Departments are responsible for equipping and training the troops to fight, while the Unified Combatant Commands are responsible for actual operational command of military forces. Almost all operational U.S. forces are under the authority of a Unified Command. 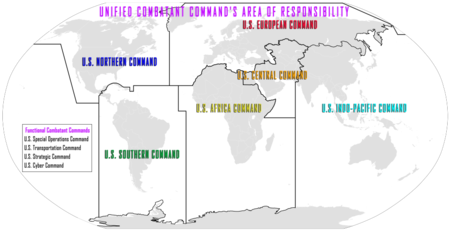 The Unified Commands are governed by a Unified Command Plan, a frequently updated document (produced by the Department of Defense) which lays out the Command's mission, geographical/functional responsibilities, and force structure. During military operations, the chain of command runs from the president to the Secretary of Defense to the combatant commanders of the Combatant Commands. Department of Defense spending in 2017 was 3.15% of GDP and accounted for about 38% of budgeted global military spending – more than the next 7 largest militaries combined. The Department of Defense accounts for the majority of federal discretionary spending. In FY 2017 the Department of Defense budgeted spending accounted for 15% of the U.S. Federal Budget, and 49% of federal discretionary spending, which represents funds not accounted for by pre-existing obligations. However, this does not include many military-related items that are outside the Defense Department budget, such as nuclear weapons research, maintenance, cleanup, and production, which is in the Department of Energy budget, Veterans Affairs, the Treasury Department's payments in pensions to military retirees and widows and their families, interest on debt incurred in past wars, or State Department financing of foreign arms sales and militarily-related development assistance. Neither does it include defense spending that is not military in nature, such as the Department of Homeland Security, counter-terrorism spending by the FBI, and intelligence-gathering spending by the NSA. In the 2010 United States federal budget, the Department of Defense was allocated a base budget of $533.7 billion, with a further $75.5 billion adjustment in respect of 2009, and $130 billion for overseas contingencies. The subsequent 2010 Department of Defense Financial Report shows the total budgetary resources for fiscal year 2010 were $1.2 trillion. Of these resources, $1.1 trillion were obligated and $994 billion were disbursed, with the remaining resources relating to multi-year modernization projects requiring additional time to procure. After over a decade of non-compliance, Congress has established a deadline of Fiscal year 2017 for the Department of Defense to achieve audit readiness. In 2015 the allocation for the Department of Defense was $585 billion, the highest level of budgetary resources among all Federal agencies, and this amounts to more than one-half of the annual Federal Expenditures in the United States federal budget discretionary budget. On 9/28/2018, President Donald Trump signed the Department of Defense and Labor, Health and Human Services, and Education Appropriations Act, 2019 and Continuing Appropriations Act, 2019 (H.R.6157) into law. On September 30, 2018, the FY2018 Budget expired and the FY2019 budget came into effect. Undersecretary of Defense (Comptroller) David L. Norquist said in a hearing regarding the FY 2019 budget: "The overall number you often hear is $716 billion. That is the amount of funding for what is called national defense, the accounting code is 050, and includes more than simply the Department of Defense. It includes, for example, Department of Energy and others. That large a number, if you back out the $30 billion for non-defense agencies, you get to $686 billion. That is the funding for the Department of Defense, split between $617 billion in base and $69 billion in overseas contingency." The Department of Defense budget encompasses the majority of the National Defense Budget of approximately $716.0 billion in discretionary spending and $10.8 billion in mandatory spending for a $726.8 billion total. Of the total, $708.1 billion falls under the jurisdiction of the House Committee on Armed Services and Senate Armed Services Committee and is subject to authorization by the annual National Defense Authorization Act (NDAA). The remaining $7.9 billion falls under the jurisdiction of other congressional committees. The Department of Defense is unique in that it is one of the few federal entities where the majority of its funding falls into the discretionary category. The majority of the entire federal budget is mandatory, and much of the discretionary funding in the budget consists of DoD dollars. In 2015, a Pentagon consulting firm performed an audit on the Department of Defense's budget. It found that there was $125 billion in wasteful spending that could be saved over the next five years without layoffs or reduction in military personnel. In 2016, The Washington Post uncovered that rather than taking the advice of the auditing firm, senior defense officials suppressed and hid the report from the public to avoid political scrutiny. In June 2016, The Office of the Inspector General, U.S. Department of Defense released a report that stated the United States Army made $6.5 trillion in wrongful adjustments to its accounting entries in 2015. The Department of Defense was the largest single consumer of energy in the United States in 2006. In FY 2006, the department used almost 30,000 gigawatt hours (GWH) of electricity, at a cost of almost $2.2 billion. The department's electricity use would supply enough electricity to power more than 2.6 million average American homes. In electricity consumption, if it were a country, the department would rank 58th in the world, using slightly less than Denmark and slightly more than Syria (CIA World Factbook, 2006). The Department of Defense was responsible for 93% of all US government fuel consumption in 2007 (Department of the Air Force: 52%; Department of the Navy: 33%; Department of the Army: 7%; other Department components: 1%). The Department of Defense uses 4,600,000,000 US gallons (1.7×1010 L) of fuel annually, an average of 12,600,000 US gallons (48,000,000 L) of fuel per day. A large Army division may use about 6,000 US gallons (23,000 L) per day. According to the 2005 CIA World Factbook, if it were a country, the Department of Defense would rank 34th in the world in average daily oil use, coming in just behind Iraq and just ahead of Sweden. The Air Force is the largest user of fuel energy in the federal government. The Air Force uses 10% of the nation's aviation fuel. (JP-8 accounts for nearly 90% of its fuels.) This fuel usage breaks down as such: 82% jet fuel, 16% facility management and 2% ground vehicle/equipment. In the latest Center for Effective Government analysis of 15 federal agencies which receive the most Freedom of Information Act (United States) (FOIA) requests, published in 2015 (using 2012 and 2013 data, the most recent years available), the DoD earned a D− by scoring 61 out of a possible 100 points, i.e. did not earn a satisfactory overall grade. While it had improved from a failing grade in 2013, it still had low scores in processing requests (55%) and their disclosure rules (42%). The organization and functions of the Department of Defense are in Title 10 of the United States Code. ^ a b "About Department of Defense". U.S. Department of Defense. Retrieved 17 July 2017. ^ "Department of Defense News Briefing on the President's Fiscal Year 2019 Defense Budget". Department of Defense. Retrieved 23 August 2018. ^ "Manual for Written Material" (PDF). Department of Defense. p. 9. Archived from the original (PDF) on 29 August 2004. Retrieved 10 December 2014. ^ "The World's Biggest Employers". Forbes.com. Forbes. Retrieved 31 July 2015. ^ "James Mattis' resignation letter in full". BBC News. 21 December 2018. ^ "U.S. DEPARTMENT OF DEFENSE > Our Story". www.defense.gov. Archived from the original on 7 October 2018. Retrieved 17 October 2018. ^ Szoldra, Paul (29 June 2018). "Trump's Pentagon Quietly Made A Change To The Stated Mission It's Had For Two Decades". Task & Purpose. Retrieved 1 July 2018. ^ Maass, John R. (14 June 2012). "June 14th: The Birthday of the U.S. Army". U.S. Army Center of Military History. Retrieved 19 June 2014. ^ Naval History and Heritage Command. "Navy Birthday Information – 13 October 1775". Retrieved 19 June 2014. ^ "Congress Officially Created the U.S. Military: September 29, 1789". Library of Congress. Retrieved 20 June 2014. ^ Joe Carmel, ed. (n.d.) [Original Statute 1789]. "Statutes at Large, Session I, Charter XXV" (PDF). Legisworks. Retrieved 28 January 2018. An Act to recognize and adapt to the Constitution of the United States the establishment of the Troops raised under the Resolves of the United Stales in Congress assembled, and for other purposes therein mentioned. ^ Hogan, Michael J. (2000). A cross of iron: Harry S. Truman and the origins of the national security state, 1945–1954. Cambridge University Press. pp. 37–38. ISBN 978-0-521-79537-1. ^ Polmar, Norman (2005). The Naval Institute guide to the ships and aircraft of the U.S. fleet. Naval Institute Press. p. 17. ISBN 978-1-59114-685-8. ^ a b "James V. Forrestal, Harry S. Truman Administration". Historical Office, Office of the Secretary of Defense. Office of the Secretary of Defense. Retrieved 25 July 2017. ^ Bolton, M. Kent (2008). U.S. national security and foreign policymaking after 9/11: present at the re-creation. Rowman & Littlefield. p. 3. ISBN 978-0-7425-5900-4. ^ "Organizational and Management Planning". Odam.defense.gov. Archived from the original on 7 May 2013. Retrieved 15 June 2013. ^ "Directives Division" (PDF). www.dtic.mil. ^ Polmar, Norman (2005). "Defense organization". The Naval Institute guide to the ships and aircraft of the U.S. fleet. Naval Institute Press. ISBN 978-1-59114-685-8. ^ a b c d Polmar, Norman (2005). "Defense Organization". The Naval Institute guide to the ships and aircraft of the U.S. fleet. Naval Institute Press. p. 20. ISBN 978-1-59114-685-8. ^ Watson, Cynthia A. (2010). Combatant Commands: Origins, Structure, and Engagements. ABC-CLIO. p. 3. ISBN 978-0-313-35432-8. ^ a b c Whitley, Joe D.; et al., eds. (2009). "Unified Combatant Commands and USNORTHCOM". Homeland security: legal and policy issues. American Bar Association. ISBN 978-1-60442-462-1. ^ Reveron, Derek S. (2007). America's Viceroys: The Military and U.S. Foreign Policy. Macmillan. p. 26. ISBN 978-0-230-60219-9. ^ "Military expenditure (% of GDP). Stockholm International Peace Research Institute ( SIPRI ), Yearbook: Armaments, Disarmament and International Security". World Bank. Retrieved 2019-03-08. ^ "United States Federal Budget for Fiscal Year 2010 (vid. p.53)" (PDF). Government Printing Office. Archived from the original (PDF) on 5 February 2011. Retrieved 9 January 2010. ^ a b "FY 2010 DoD Agencywide Agency Financial Report (vid. p.25)" (PDF). US Department of Defense. Archived from the original (PDF) on 14 December 2010. Retrieved 7 January 2011. ^ "Financial Improvement and Audit Readiness (FIAR) Plan Status Report" (PDF). Comptroller, Department of Defense. Retrieved 16 September 2016. ^ "Current & Future Defense Capabilities of the U.S." UTEP. Archived from the original on 2 August 2015. Retrieved 18 August 2015. ^ "Federal Spending: Where Does the Money Go". National Priorities Project. Retrieved 18 August 2015. ^ Granger, Kay (2018-09-28). "Titles - H.R.6157 - 115th Congress (2017-2018): Department of Defense and Labor, Health and Human Services, and Education Appropriations Act, 2019 and Continuing Appropriations Act, 2019". www.congress.gov. Retrieved 2019-02-16. ^ "FY 2019 PB Green Book" (PDF). ^ "The FY2019 Defense Budget Request: An Overview" (PDF). ^ "FY2019 Budget Request Overview Book.pdf" (PDF). ^ Whitlock, Craig; Woodward, Bob (5 December 2016). "Pentagon buries evidence of $125 billion in bureaucratic waste". Washington Post. ISSN 0190-8286. Retrieved 18 December 2017. ^ "U.S. Army fudged its accounts by trillions of dollars, auditor finds". Reuters. 19 August 2016. Retrieved 18 December 2017. ^ Andrews Anthony (2011). Department of Defense Facilities: Energy Conservation Policies and Spending. DIANE Publishing. p. 1. ISBN 978-1-4379-3835-7. ^ a b Colonel Gregory J. Lengyel, USAF, The Brookings Institution, Department of Defense Energy Strategy, August 2007. Wikimedia Commons has media related to United States Department of Defense and The Pentagon. Death and Taxes: 2009—A visual guide and infographic of the 2009 United States federal budget including the Department of Defense with data provided by the Comptrollers office.